Our rugged cowboy cross looks great on your saddle, horse's stall door, door knob, cycle handlebars, wall, or car mirror. 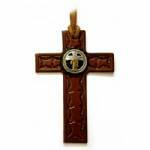 The cross is cut from rich bridle leather in your choice of black, dark brown, or medium brown and is decorated with a hand-stamped border. Border patterns will vary, but will be similar in general appearance to the example shown. A pair of leather rosettes attractively frame the concho, and a sturdy leather thong (not shown) is laced through the slot at the top. The concho is available in a variety of designs. Click " View more images" to see what we typically have in stock. Since conchos go in and out of fashion, our selection will vary. The cross is 4 1/4" wide and 9 1/2" tall.